Every kid from the '90s knows just how big of a deal Lisa Frank was back in the day. Those colorful, psychedelic merchandise were (are???) super covetable—seriously, the backpacks were a status symbol all on their own. And out of the many cute creatures decorating the products, that fabulous unicorn was probably what our grade school selves lusted after most. World, say hello to Unicorn Lashes’ Ultimate Unicorn Kit—10 makeup brushes inspired by those beautiful mythological beings. Each set contains a contour brush, a buffing foundation brush, a powder brush, three eyeshadow brushes, a blush brush, a concealer brush, and an eyebrow brush. Let’s be real, though. 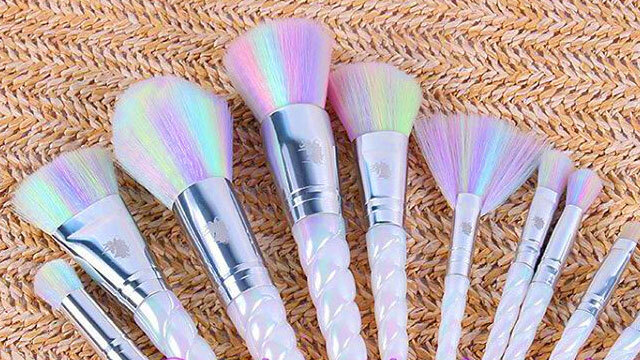 We’re really just going to buy this set for the unicorn horn handles and the colorful bristles. Sign up for Unicorn Lashes’ mailing list to get first dibs. These babies launch in October for £45 (around P2,820), so get on it!